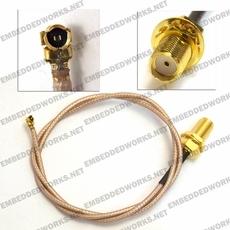 This RF Cable Assembly is commonly used for Cellular (GSM/CDMA) radio modules which require the Hirose U.FL or iPEX connector. Additional lengths are available in 100mm increments. This assembly uses the higher quality RG178 cable, which has approx. .4dB per foot loss @ 900Mhz. The SMA-Female connector does not have a center pin, and has a backing nut for bulkhead installations.